Fairy Tales come in all forms. Throughout history, we are told elaborate stories of wolves, children and monsters all designed to teach us a moral and ethical lesson. But they all have an underbelly that when you actual read between the lines, is actually terrifying for kids. Why would parents tell these horrible tales to kids? But Tim Haskell is more than happy to tell his kid (see the video below) and is excited to introduce these terrifying tales to us in this version of Nightmare, the latest incarnation of his world famous haunted house. Having attended the previous 2 years haunts (Nightmare: Superstitions and Nightmare: Vampires) I love how Haskell and his team change it up year to year. Now back at their original location in the Lower East Side (NYC), this latest version is an experience back to our macabre childhood, where the monsters are allowed to terrify us once more and unfortunately there is no bed we can hide under. Nightmare: Fairy Tales use of storytelling, gimmicks and elaborate sets are what separates it from the rest. Clearly, the BOO! factor is in play but you're reminded of each of these fairy tales and how wonderful the stories are. My journey into Nightmare: FT was on press/Twitter night, where a few select group of people got to go to the experience before it opened. Usually this is to get the kinks out of the haunt and I was more than happy to be a Guinea pig in this experiment (we'll get to a few examples later on). Accompanied by my friend "K" and a stranger from a foreign land "F", we were the final group to experience the haunt. The waiting is much of the buildup as the actual experience. Surely by the time you read this, you'll be waiting on a long line and having butterflies in your stomach. The atmosphere in the building, the dimly lit bar next to the haunt and the characters mulling around the line will have you on your toes. A "Woodsman" and an "Executioner" were fun conversations as "K" and me waited in anticipation. Knowing we would be the last of the parties to enter also built up a level of dread. Would the cast go a bit extra serial killer on us? We are given a business card where our name and greatest fears were asked to be written down is how it starts. Greeted by Rapunzel, we are quickly blindfolded and led by her hair into the haunted house. It's a great and awesome way to start the haunt, total darkness and disorientation to get you scared shitless. Each room is ingeniously designed. I have always taken my time to admire the work that's been done to each set piece. The actors are all full of energy as we encounter fairy tales from Hansel and Gretel, The Boy Who Cried Wolf, Rumpelstiltskin, Snow White and Red Riding Hood. Given a map of the haunt at the beginning of the tour (it's a little useless unless you find "the secret room"), you'll need to step carefully as the scares are well hidden from your view. I've always said that the person who enters the room first isn't necessarily the one that will get jolted by a BOO! It can come from anywhere, at anytime and from anyone. The best thing of all the Nightmares is the ability to interact with the characters. One of our devilishly dressed characters asks "K" what her greatest fear was and responding she said roaches. "F" and I looked on as she was taunted by this fear monger. And like WHOOSH! she was gone. Characters come to life, they experience pain and the well lit signs tell you from what fairy tale it's from. Passing over a rickety bridge and then down a Pinocchio gauntlet are one of the many obstacles to over come. But one of the most fascinating events from Fairy Tales comes in the form of a shadow play that tells the tale of a young child and an executioner. I haven't seen a shadow play in a quite a while and it was mesmerizing to watch. Watch out for the surprise. Remember to check in via Facebook to get a map so you can experience the secret room. You'll have to figure out who you've been talking to, to *GASP* save your soul. The whole fairy tale part lasts around 20 or so minutes but that's not the end of your journey, it's the beginning. Another component to this year’s NIGHTMARE will be a sensory assaulting 5-D theatre experience called THE EXPERIMENT created and directed by John Harlacher and Timothy Haskell. Unlike year's past where the second event was a much smaller prelude to the main event, THE EXPERIMENT is actually Full-on, every bit as satisfying and experiential as the haunted house. Experienced from your chair in a small lab, you are a subject in a case study for research on the threshold of fear. Will YOUR limits be hit? 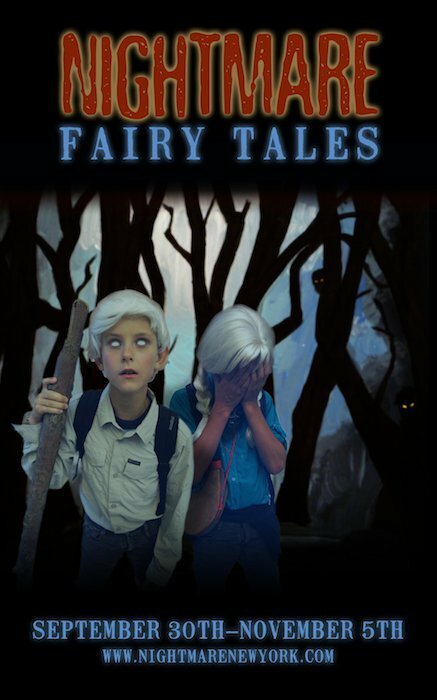 It's a clear 360 degree switch to go from fairy tales and a traditional haunted house to this psychological experiment turned awry. Each experiment is designed to get you out of your comfort zone. Due to the fact I was in a group of only 3 people, The Experiment is full of ways to embarrass you and even make you laugh. After you've made your way upstairs, you enter a bizarre theater where a well dressed "professor" proceeds to get your name and where your from. From here it turns out to be a Q&A from hell. The one thing its designed to do is to grab on to your fears. And for many of us fear of public speaking is one of the worst things one can go through. Even with "K" and "F" the only audience, I was hesitant to participate. The professor does say if you are "uncomfortable" with the questions, you can say so and nothing is asked further. I can imagine on a packed night, the audience can be full of people from 10-20 people and if selected it could be horrifying. Questions about bathroom activities, arousal and what you fear the most are one of many questions where you have to stand in front of the crowd and reveal. Others included the use of illegals and legal substance abuses as well as acting out the worst fears in your life. It's a unique spin on the supposed haunted house and I'll admit it was kinda awesome. My partners in crime were equally confused and bewildered and "F", a tourist from Germany who stumbled upon press night had a grand ole time experiencing this most American of Halloween endeavors. Where we PAY to be scared by strangers. I highly doubt this happens in Germany. Once the bizarro Q&A is over, you trudge through claustrophobic darkness and emerge in a well lit lab, complete with a poncho and see headsets on the chairs. The lab is full of HD monitors, various lab equipment and a two scientists (one male and one female) who begin a series of experiments that may get your squirming (as it did me) and jumping out of your seat. You'll be exposed to a few animals that you detest, listen and watch a video that will spook the hell out of you and be "blessed" with some substances that the inner germaphobe in you will freak out. The finale is one that is an exploding mess! 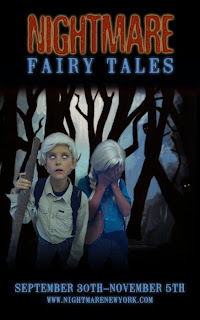 Nightmare: Fairy Tales has done a great job of reinventing themselves this year. These 2 parts of the haunted house are completely different and oddly enough compliment each other. Haskell has in a fact, taken the traditional, mixed in the experimental and created a new haunted house that will scare you both internally as it does externally. Rarely can one personalize a haunted house to the masses but Nightmare: Fairy Tales does just this. It's truly a revolution of the haunted house, one that is tailored to the fears you've overcome and with the fears that still linger in you. My friends and I eagerly discussed right after the experience what had happened. You will to. The fear you have to overcome first....is the one where you have to build up the courage to actually VISIT Nightmare: Fairy Tales. It's the first step towards an experience you won't soon forget. To buy tickets to NIGHTMARE: FAIRY TALES visit www.nightmarenewyork.com or call 212.352.3101. Tickets are $30 in advance/$35 at the door. VIP tickets are $60 and gets you to the front of the line with no wait as well as a goodie bag. A Super VIP ticket is available for $100 and gets you to the front of the line. It also includes a goodie bag, a t-shirt, two drinks and a backstage tour with the director after you walk through. If you check it out, come back here and leave a comment about your experience! Hi JV! Do you know which part of the house represented "the boy who cried wolf"? I can't figure that one out! Hmmm not sure Julia. I read your comment on FB. Seems like they switched up The Experiment portion for the crowd. Sounds like it was more icky than when I went. Did you know that you can get these AUTOMATICALLY AND TOTALLY FOR FREE by using Like 4 Like?